1. Developing the pincer grasp. 2. Crossing over the mid-line — right hand crosses the body to the left side and vice versa, an important part of brain development. These are BIG skills. Montessori tells us we must isolate and refine the difficulty. We have already isolated the skill of transferring. Now we refine it. 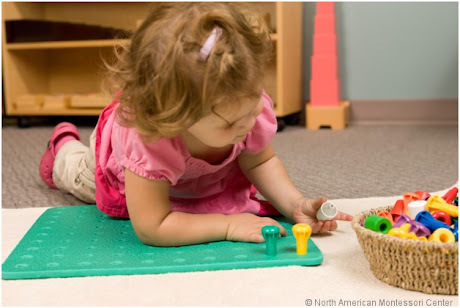 So, let’s look again at the big skill of developing the pincer grasp. You can also add variety by adding in spoons not often used, such as Chinese soup spoons, jelly spoons, or grapefruit spoons. These help keep the child’s interest! 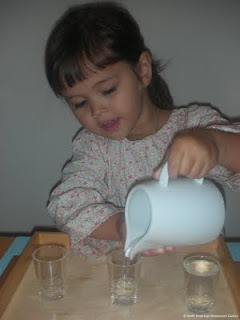 The use of glasses, cups, pitchers, and funnels can be used with both dry and wet items. 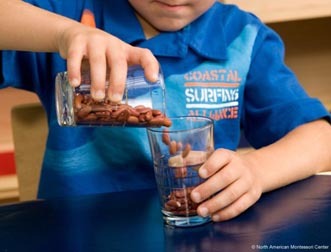 For dry pouring, you can use items including beans, grains, sand, and sugar. Wet pouring is introduced with water, but you can use liquids with different viscosities as well, such as syrup or honey. Varying the contents also adds an element of difficulty as well as keeping interest high. 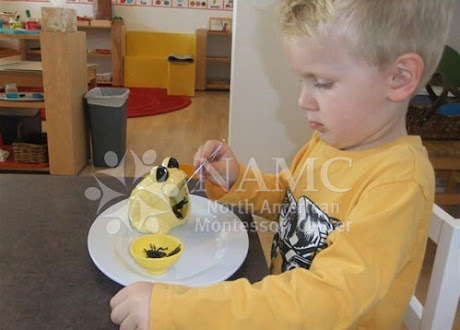 © North American Montessori Center - originally posted in its entirety at Montessori Teacher Training on Friday, September 27, 2013.